Two Cumbrian friends have come up with an invention they claim could help consumers save thousands of pounds in energy bills. 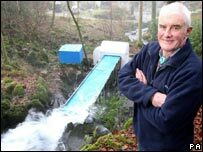 Ian Gilmartin, 60, and Bob Cattley, 58, both from Kendal, say their mini-waterwheel could supply enough free electricity to power a house. The device is designed to be used in homes close to small rivers or streams. They secured a £15,000 grant from the Lake District National Park to build a working prototype near Windermere. The device is claimed to be the first off-the-shelf waterwheel system which can generate a good supply of electricity from a water fall as little as 8ins (20cm). Mr Gilmartin is an electrician by trade, but does not own a TV and has never lived in a house with electricity. He first began experimenting three years ago with yoghurt pots and wheelie bins in a stream close to his home, before test-running a prototype. This now produces almost all the daily electrical needs of an average home. It is hoped to go on sale by the end of 2007 and is set to cost about £2,000 to fully install. Mr Gilmartin said: "It is expected to pay for itself within two years and then greatly reduce the owner's electricity bills after then. "I have been thinking about this for a long time and tried various solutions. "I have come up with an answer and I don't know why anyone has not thought of it before."